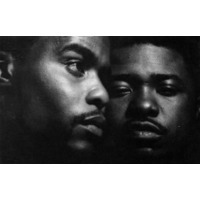 Nice & Smooth was an East Coast hip hop duo from New York that consists of Greg Nice (Greg Mays) and Smooth B (Daryl Barnes). The duo released four albums from the late 1980s to the mid 1990s. Their first collaborate appearance was on the song, "Pimpin Ain't Easy" by Big Daddy Kane on his album, It's a Big Daddy Thing in 1989. Nice & Smooth's biggest radio fame came from "Sometimes I Rhyme Slow...," from the group's second album, Ain't a Damn Thing Changed, released in 1991. The song was a moderately somber rhyme with introspective lines about poverty, AIDS, and drugs that was set to the guitar loop from Tracy Chapman's hit "Fast Car." In the summer of 1992, the music video received heavy rotation on MTV. "Hip-Hop Junkies," which featured a sample from The Partridge Family's "I Think I Love You" was also a hit, and it was once performed live on Keenan Ivory Wayans’ comedy/variety TV show, In Living Color. The duo is known for its humorous rhymes and catchy hooks. They often appeared as guest emcees on albums by the Beatnuts, Gang Starr, and Tony Touch among many others. Tupac Shakur intended to sign Nice & Smooth to his Makaveli label and even recorded tracks with the duo for the One Nation album. Trugoy from De La Soul paid homage to Nice & Smooth by using each member's rhyming style in verses on the song “Simply Havin'” from De La Soul's AOI: Bionix album. Smooth B wrote rhymes for Bobby Brown that appeared in his debut album King of Stage and second album Don't Be Cruel. In 2005, he released a single titled "Game Over," which was produced by DJ Premier.